Hello! Happy December 26th! Will you be braving the stores for after Christmas sales? No shopping for me (I'm not a big fan of shopping and if I prefer to shop online in the comfort of my home and pjs... lol!). It's time for a brand new Mojo Monday sketch (#221). It's also the last Mojo sketch of the year... I hope you will join us this week! Debbie has created a couple of great sketches (it's round or square week!) for us to play with! I made a scrappy and stitchy little birthday card (it's 4.25" x 4.25") this week. 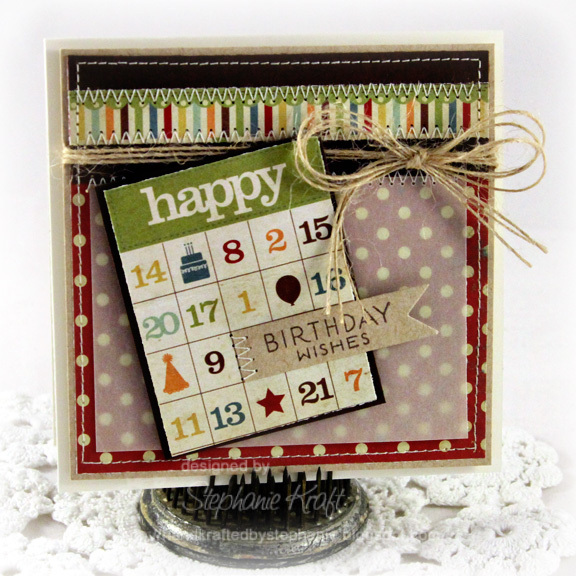 I used some fun paper from Simple Stories Happy Day and just stamped a little sentiment from Birthday Phrases. Accessories: Die-namics First Place Award Ribbon (My Favorite Things), Twine (May Arts), Foam tape, Thread, Sewing machine. Love how bright and vibrant this card is, love the way you tied the twine, the stitching...I am just loving all the details on this. Beautiful. What a great idea, love this!!! OOOH! LOVE this Steph! LOVE how you stitched the sentiment onto the Bingo card!! I love bingo cards. The twine finishes up the card perfectly. Thank you for sharing your creativity and inspiration.